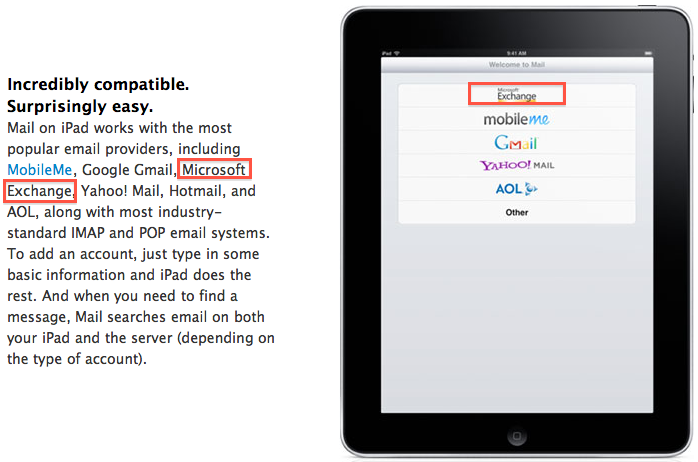 When Apple announced the iPad, I was puzzled that Microsoft Exchange email support was not listed. Sure, the iPhone has fairly good Exchange ActiveSync support, but not all iPhone features will be included in Apple’s tablet. Considering the high profile Exchange enjoys in the iPhone details page and the exhaustive list of supported mail servers on the iPad page, the absence of Exchange was notable. I wondered aloud if perhaps Apple would release a corporate option pack with Exchange ActiveSync, VPN, and other enterprise features. Happily, this appears not to be the case. Apple updated the iPad site contents while announcing pre-ordering of the device, and Microsoft Exchange is now included. This is a relief – I suspect many would be very disappointed if they couldn’t use their new toy at work! VPN support still is not listed anywhere on the iPad site, however. But since my fear of an enterprise option doesn’t look to be coming true, I’m going out on a limb and suggesting that this will be in the package on April 3 as well.